Amazon has launched its official WordPress plugin called Amazon Associates Link Builder that lets you create Amazon affiliate links and add products to your posts without having to leave your WordPress dashboard. The plugin is helpful for bloggers who want to add affiliate products quickly without having to visit Amazon site and copy paste the product images. There are few free as well as paid plugins like Amalinks Pro are already available, but for people on a budget, it is better to use the official free plugin. Amazon’s product catalog search built directly into the WordPress editor. Responsive ads sizes as well as fixed, custom sizes. Since it’s just like any other WordPress plugin, the steps required to install it on your WordPress site remains the same. 2. 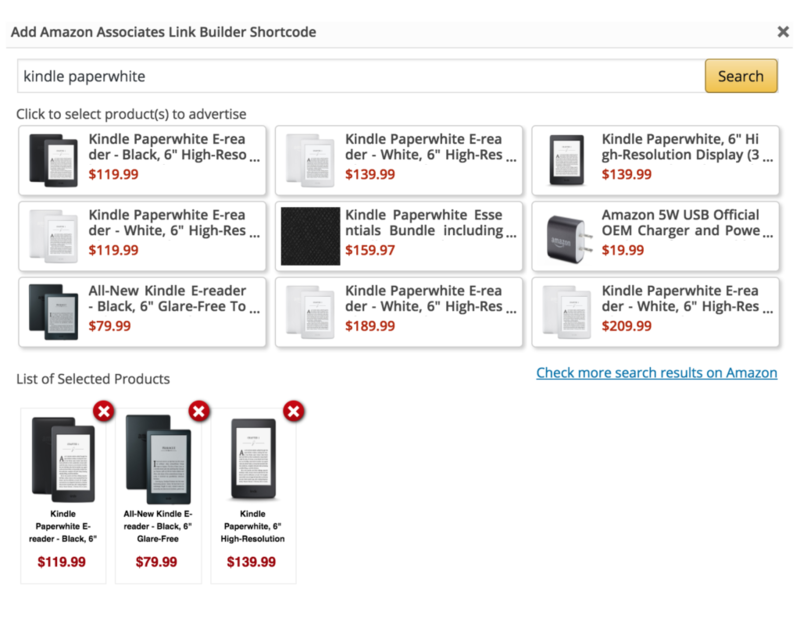 Search for ‘Amazon Link Builder’ which would show the relevant results. Before you can add products using the plugin, you have to do a basic setup like adding your Amazon account and API. 1. After installation of the plugin, Go to Associate Link Builder > Settings. 2. Enter your Access Key ID, Secret Access Key, Associate ID. 3. Choose the Default Associate ID, Marketplace, and Template design. 4. Tick the agree to T&C and save the changes. 5. Now you’re ready to add products to your posts. 1. While you’re in your WordPress post editor, you’ll see Amazon logo with a search bar next to it. 2. Enter the keyword of product you want to search. 3. Choose the product, associate ID, marketplace, and template you would like to add. 4. Click on ‘Insert shortcode, to insert the product into your article. You can use the same shortcode to add same product to multiple posts or positions. Since the plugin is still in its Beta phase, there may be certain bugs and glitches. One such known problem is images not getting displayed on sites using HTTPS. Below is the official Amazon statement about this issue. Currently, images are failing to display on sites using HTTPS. We are aware of the problem and expect a fix to be live before Christmas. The fix will be automatic and will not require additional actions by affiliates. What do you think of Amazon Link Builder Plugin? Is it any good or you’re satisfied with the current method of adding affiliate links and products? Share your suggestions in the comments section below. And do socialize this post with your friends and followers. Amazon does not allow secret or access keys until after a sale has been made. How will this affect this plugin? Thank you Shafi for this useful post. I have downloaded the amazon plugin but haven’t used it so far. What I normally do is go into my associate account and do a search on “product link” to get the short code. I then insert that over the text that I use for that particular product. I do not know if that’s the best way to do it though. Any suggestions? But using the Amazon’s official plugin will save your time + you don’t need to worry about getting banned or doing something against their T&C. You can directly search for products in your WordPress dashboard and insert it to your post. Additionally, you get geo-targeted links which weren’t present before. I hope that solves your queries. I have installed this plugin but it doesn’t show any images or templates (I have set up the PluginGrid) at all on the website and we are not using HTTPS?! A little disappointed as every plugin I have used has failed to display anything or work at all. Excellent post!!. Great collections.. It’s really helpful to us. I follow blog for tips and guidelines. Well, Amazon has done a great job releasing Amazon Link Builder Plugin, but it certainly lacks some of the key features like Link localization which is present in 2rd party Plugins like Easyazon, so i hope so, they will add it in their premium version once this free version become successful. That is less likely to happen as Amazon is strictly against link localization and they do not suggest users to do it. However, it would be an interesting feature to have. Like EasyAzon, user redirect to country store or not? Eg, If we add US and India store in easyazon and visitor come from India so its redirect to Indian store where US visitor redirect to US version. It is an official plugin from Amazon, and Amazon doesn’t allow link cloaking. Hence, there won’t be any automatic redirects for different countries. Thanku dear for giving me such a useful information. Before reading this topic i don’t know about this plugin. It would be great if you would use your real name instead of URL or otherwise I would not approve your comments from now on.